A former staff attorney at the First Department Disciplinary Committee has filed a federal lawsuit charging she was fired in June in retaliation for complaining that her superiors had engaged in a "pattern and practice of whitewashing and routinely dismissing complaints against certain select attorneys." Christine C. Anderson, who had worked for six years at the disciplinary committee, seeks $10 million in damages, claiming retaliation for the exercise of her First Amendment rights and discrimination because she is of Jamaican origin and black. Ms. Anderson also asks for the appointment of a federal monitor to oversee operation of the disciplinary committee. David Bookstaver, a spokesman for the Office of Court Administration, said it would be "inappropriate" to comment on pending litigation. Ms. Anderson alleged two instances in which her recommendations had been overridden or changed by her superiors at the committee. 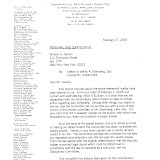 In 2005, Ms. Anderson charged in her complaint, she discovered that the chief counsel of the disciplinary committee, Thomas J. Cahill, and Sherry K. Cohen, its first deputy counsel, were "apparently engaged in a 'numbers game' and practice" of "selectively" dismissing complaints against attorneys for their "own personal and political reasons." 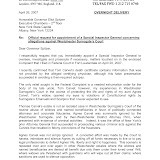 A possible second, or alternative reason for the dismissals, the complaint stated, was that the prosecutions of the complaints would be "burdensome or otherwise 'unworthy' of prosecution." Ms. Anderson also charged that in one incident, in July 2006, Ms. Cohen physically blocked her from leaving her office and, in so doing, had dug her nails into the plaintiff's hand, causing scratches. Mr. Cahill declined to comment on the allegations; Ms. Cohen did not return a call for comment. 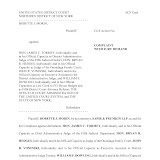 In addition to suing Mr. Cahill and Ms. Cohen, Ms. Anderson named as defendants Justice John T. Buckley, who was presiding justice of the Appellate Division, First Department, until May; former Clerk of Court Catherine O'Hagan Wolfe, who resigned in April to become clerk of the U.S. Court of Appeals for the Second Circuit; and the Office of Court Administration. The case, Anderson v. State of New York, was filed on Friday in the Southern District, according to Ms. Anderson's attorney, Frederick K. Brewington of Hempstead. Mr. Cahill's retirement was announced in July, though he is remaining as chief counsel until a successor is chosen. The first instance of a "whitewash" alleged in Ms. Anderson's complaint occurred "in or about 2003" in "a highly sensitive investigation," which had uncovered "overwhelming concrete evidence of misconduct" by an attorney, Ms. Anderson alleged. The matter was dropped despite her recommendation that a formal complaint be filed against the lawyer, Ms. Anderson alleged. 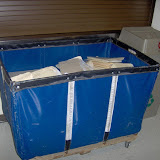 She also charged that a large file she had amassed containing "indisputable evidence of misconduct" had been "gutted." The second instance in which Ms. Anderson's handling of a case was overridden occurred about two years later, she alleged. In that case, she stated, Mr. Cahill had asked her to write an introductory paragraph to the policy committee, explaining her recommendation that an attorney be given a non-public admonition rather than be the subject of a formal proceeding that could lead to a public sanction. Ms. Anderson explained in her complaint, that, although the results of a "complex investigation" of the attorney "argued strongly in favor of charges," there was "lack of actual proof of a conversion." She also stated there had been an "initial lack of cooperation" from the client complaining against the lawyer. 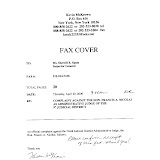 Ms. Anderson stated that she wrote an introductory paragraph explaining the gravity of the attorney's conduct, but that Ms. Cohen had rewritten it, "deleting facts" Ms. Anderson had uncovered during her investigation and conclusions she had reached. Ms. Anderson quoted Ms. Cohen as saying the reason she had rewritten the paragraph was to avoid having the policy committee send the matter back to staff for the preparation of a formal complaint. Ms. Anderson further charged that Ms. Cohen had done this because "she had a prior working relationship" with the attorney for the lawyer under investigation and sought to avoid having his client formally charged "as a favor." The complaint did not identify the two lawyers who were the subjects of the proceedings cited by Ms. Anderson. Mr. Brewington said in an interview that he would not name them "at this time." 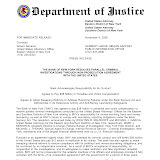 BREAKING STORY: An OCA rattling federal lawsuit was filed late Friday, October 26, 2007, in The United States District Court for the Southern District of New York. The allegations by an insider reveal a previously hidden look into the systemic corruption within the statewide court system and, most horrifically, concerns the very body charged with overseeing ethics and integrity within the state's courts. 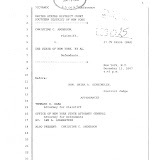 The named defendants include The State of New York's Office of Court Administration (OCA), and the Hon. 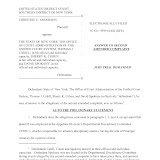 John Buckley, Thomas J. Cahill, Sherry K. Cohen, Catherine O'Hagen Wolfe and David Spokony- all senior level state employees involved with the 1st Judicial Department's Departmental Disciplinary Committee (DDC), which is charged with overseeing the ethics of attorneys in The Bronx and Manhattan. The papers filed in federal court include, "Plaintiff requests the appointment of a federal monitor to oversee the day-to-day operations of the DDC for an indefinite period." Judge Francis Nicolai decided to challenge the minor parties that had denied him an endorsement. He lost the case. Now, what's going to happen if he wins the election? Now that Ninth District Administrative Judge Francis Nicolai's petition to overturn the judicial nominating conventions of three minor parties has been rejected, the Westchester jurist is left to deal with a political and judicial establishment that might feel besmirched, if not insulted. In his claim, Nicolai named not only the local leadership of the Independence, Conservative and Working Families parties as respondents — but the four sitting judges they endorsed: incumbent Republican Supreme Court Justice William Sherwood and Westchester County Court Judge Rory Bellantoni, running in his first Supreme Court race, as well as Nicolai’s fellow Democrats, Orange County Surrogate Elaine Slobod and Rockland County Surrogate Robert Berliner, both seeking their first Supreme Court wins. It will be all the more so if Nicolai wins the upcoming election. And that’s quite possible in the Ninth District, even without cross-endorsements. Should he remain Administrative Judge, in charge of supervising the activities of fellow judges who know that he tried to have colleagues’ ballot positions struck down, it could get downright messy. Given his refusal to step down as Administrative Judge for the duration of the litigation, it is fair to wonder whether Judge Nicolai anticipated the possible fallout. The Ninth Judicial District — comprising Westchester, Putnam, Orange, Dutchess and Rockland Counties — is home to one of New York State’s few competitive judicial electoral environments. Democrats and Republicans don’t always cross-endorse each other’s candidates, and the population is diverse enough that neither party is guaranteed victory. 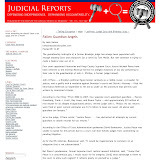 Click here for a Judicial Reports article about the region. That means that so-called minor parties’ secondary endorsements of major party nominees can matter a lot: The few thousand votes a cross-endorsed candidate gets from the loyalists in the Working Families or Independence or Conservative Parties can tip a race. Nicolai’s attorneys were in part relying on the 2006 federal decision, subsequently upheld by the U.S. Court of Appeals for the Second Circuit, that struck down New York’s opaque judicial nominating system. That case is currently before the U.S. Supreme Court, but its members seemed disinclined to uphold the ruling when oral arguments were held in early October. As it turned out, Supreme Court Justice Kimberly O’Connor of Albany, in the Third District, dismissed the case primarily on procedural grounds, thus avoiding Buss’s contention. 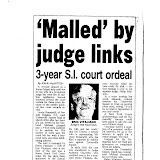 But John Ciampoli, who represented the Conservative and Independence Parties, faced it head on, alluding to the U.S. Supremes Court’ apparent antipathy to the case. “The fact of the matter is, anyone who’s been following the law knows that the Second Circuit’s decision that the convention system is unconstitutional is dead on arrival,” Ciampoli said. Though largely procedural, O’Connor’s nearly identical decisions in the three cases were hardly kind. Brusquely dismissing Nicolai’s claim that his complaint stemmed from violations of statute and case law (rather than internal party machinations), she agreed with Ciampoli’s assertion that “being upset is not sufficient to establish standing.” Such status, she reasoned, would only accrue to petitioners who claimed that their rights had been curtailed by procedural irregularities within their own parties’ conventions. In other words, since Nicolai is not a member of any of the three minor parties against whom he petitioned, he couldn’t cry foul. O’Connor’s ruling was enough to send Thomas Abinanti, who represented Nicolai against the Conservative and Working Families Parties, into a rage. “This interpretation means that political leaders can do whatever they want,” he said. Indeed, Patrick Welsh, Chair of the Westchester County Working Families Party, was candid about his colleagues’ calculus. With four candidates vying for three spots (two of the three Republican candidates did not seek it), “we figured we’d give representation to as many counties as possible,” he said. Since Democrats Slobod and Berliner were each from different Upstate counties, they were shoo-ins. That left Democrat Nicolai to compete for the Working Families nomination against Westchester County Court Judge Rory Bellantoni, a registered Republican. When it cross-endorses a major party candidate, the Working Families Party goes with the Democratic ticket the vast majority of the time – but not always. Similarly, Nicolai sought the Conservatives’ endorsement but lost to Bellantoni, Sherwood and Slobod. He did not seek the Independence Party’s endorsement at all. The party chairs were less than thrilled that Nicolai’s suit put their 2007 ballot lines in jeopardy. Due to a 2006 court challenge to their organizational rules, Independence Party leaders particularly despise the court that Nicolai oversees. Though they eventually won on appeal, party leaders believe, fairly or not, that Judge Nicolai was part of the reason the litigation dragged on so long. His recent litigation loss is particularly surprising, given Nicolai’s track record when fighting for pet causes. He certainly knows election law, having practiced it as an attorney in the 1970s and early 1980s and having since adjudicated many such cases. His judicial track record is also nothing to sneeze at. He has a civil case reversal rate of 35 percent, with the average for his colleagues in the Appellate Division, Second Department clocking in at 45 percent. He also remained a savvy litigant once on the bench. 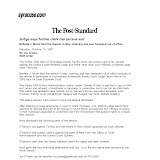 In 1994, the Appellate Department affirmed a lower court ruling in a pay parity case that Nicolai had brought in the late 1980s when he was serving as a judge in Westchester County Court. 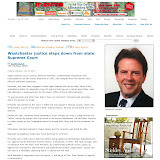 In essence, Nicolai’s argument cleverly showed that he and the other Westchester County and Family Court judges did as much work as their colleagues in Nassau and Suffolk (who had recently won a tougher case asserting they deserved pay parity with Supreme Court justices) and that their cost of living was similar. His lawyer won handily. Smart strategy. Finely tuned political radar. All of which makes his pursuit of this highly charged, partisan case somewhat surprising. Even more baffling, he once dismissed a similar case for reasons mirroring those O’Connor cited in tossing his current claim. 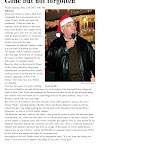 In 1994, Nicolai, rejected a Supreme Court candidate’s claim that Conservative Party irregularities should have invalidated its endorsement of an opponent. In essence, Nicolai ruled that any irregularities did not trump the clear reality — that party members preferred the other candidate. So why didn't Nicolai sense a similar dynamic when the parties sought his temporary removal as AJ during the recent litigation? Asked if he perceived any tension or inherent conflict of interest in remaining supervisor of judges whose nominations he sought to invalidate, Nicolai said, “None that I’m aware of. Absolutely none. It’s a matter that is not unusual for someone to ask the court for judges” to decide an election issue. However commonplace the litigation, the fact remains that, should he be elected, Nicolai will oversee members of the bench who were forced to fend off his efforts to strip them of their political endorsements. Awkward indeed. ALSO, SEE RELATED STORY: "Judicial Destruction of Court Records"
Bail is usually forfeited if a criminal defendant fails to appear for a scheduled court appearance. In courts everyday, though, many judges extend great latitude to defendants who have failed to appear, often negating “bench warrants” and “bail forfeiture” when certain facts are revealed to the court. “Failure to appear” determinations are excused when the judge is moved to accept the absence as unintentional, usually a result of a personal emergency or a simple mix-up of the scheduled date by the defendants, their attorney, court personnel or a computer. As one Manhattan criminal defense attorney explains, “If you have a good and honest reason for not showing up in court, judges are usually understanding,” adding, “but there are only two perfect excuses for not being in court--you’re dead, or in jail somewhere.” In short, if bail is forfeited, it is lost—gone. And the money goes to the county—except, as the newest allegations claim, in Jeanine Pirro’s Westchester County. Numerous seasoned criminal defense lawyers interviewed for this article, and who demanded that their names not be used, were emphatic about their belief that except for only very rare exceptions, forfeited bail money is gone—and it gets deposited into the county coffers. 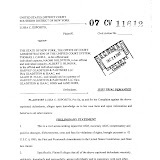 But the latest issue to haunt the former county judge, Ms. Pirro, alleges a different bail process in the criminal courts of Westchester County--that for a ten-year-plus period of time, and while she was the Westchester County District Attorney, Jeanine Pirro systematically prevented millions of dollars in forfeited bail monies from being delivered to the citizens of Westchester County. 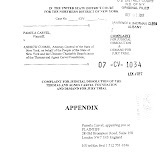 According to criminal court documents obtained in one case, The People of the State of New York vs. Edickson Herrera, Ms. Pirro’s office failed to file the necessary paperwork to insure that the Westchester County government would receive $250,000.00 in forfeited bail money. The defendant had failed to appear in court on October 5, 1995, and though the court issued a bench warrant that day, the bail forfeiture became effective 5 days later on October 10, 1995. To make sure Westchester County received the $250,000.00, the District Attorney was simply required to file a copy of the forfeiture order within 60 days. 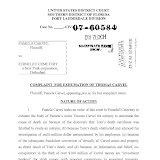 As a result of District Attorney Pirro’s failure to simply file a copy of the forfeiture order within the then-required 60 days, the Judge was forced to return the $250,000.00 to the petitioner, the Frontier Insurance Company. SEE RELATED STORY: "Judicial Destruction of Court Records"
BOSTON -- A state commission filed misconduct charges Monday against a Plymouth County probate and family court judge, accusing him of violating judicial rules by running a real estate business and collecting fees as an attorney while serving as a judge. The Commission on Judicial Conduct said Judge Michael Livingstone engaged in a pattern of misconduct that also included sending an improper letter threatening to evict a tenant and failing to disclose income from his business activities to the State Ethics Commission. 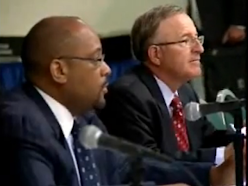 Livingstone admitted he made some errors but denied he ever acted dishonestly. 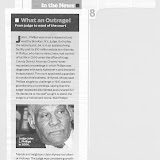 "Judge Livingstone is a very hard-working, conscientious probate judge who is widely respected. None of these charges have anything to do with what he did on the bench," said Livingstone's attorney, Michael Mone. The commission cited Livingstone's role in High Low Properties, a real estate partnership that owns properties in New Bedford. The commission said that after Livingstone was appointed a judge in December 2002, he remained a general partner of High Low but asked his business partner, Raymond Hotte, to take over managerial responsibilities for the two apartment buildings owned by the partnership. Livingstone filed a sworn affidavit saying he had not been actively involved in the management of the properties for years and that Hotte was responsible for all tenant-related matters. The commission said both those statements were false because Livingstone had had an active role in managing the properties since late 2004, when he and Hotte had a falling out and Hotte quit. The charges against Livingstone grew out of the investigation of two complaints — one filed by Hotte and one filed by the Supreme Judicial Court. The commission cited a letter Livingstone wrote to a tenant in which he said he would not pay her utility bills and would have her evicted from her unit if she did not pay her rent. The commission said that it is against state law for a landlord to intentionally fail to provide water, heat, light power or gas. "The fact that Judge Livingstone is a judge makes his improper threat to (the tenant) even more serious, given the potentially coercive effect of his letter," the commission said in its written charges. In a written response, Mone said Livingstone acknowledges that the wording of the letter "may have been inappropriate" but said it "was never intended by him to be a threat." Livingstone, who had his own law practice in New Bedford before he became a judge, entered into an agreement with another attorney, Jane Warren, who said she would pay him 25 percent of the fee she received from his divorce clients and 50 percent of the fee from his estate clients. Under the arrangement, Warren paid Livingstone approximately $49,000 from 2003 through 2006. The commission said the agreement and his failure to disclose that he shared fees with an attorney violated the rules of conduct for judges. Livingstone said payments he received from Warren were part of a buy-out of his law practice and not a fee-sharing arrangement. Mone also said that Livingstone performed some management duties for High Low only because his partner had quit. "Judge Livingstone attempted to maintain the High Low properties so that tenants would receive utilities and services that they required and did so only because Mr. Hotte, without notice, had abandoned his duties with regard to the management," he wrote in the response. The commission has asked the state Supreme Judicial Court to appoint a hearing officer to preside at a public hearing on the charges. The hearing officer will then make a recommendation to the commission on possible sanctions, which could include a fine, reprimand or censure. The Supreme Judicial Court makes the final decision on judicial sanctions. A New Jersey attorney and his client, who last May escaped conviction on charges they unduly pressured an elderly widow to name them as executor and beneficiary of her multimillion dollar estate, now are trying to avoid punitive damages. A New Jersey appeals court ruled last December that although Ronald Casale and his client, Dr. Ronald Sollitto, could not be forced to pay attorney fees to the beneficiary they effectively disinherited, a jury could still assess punitive damages against them. Last week, Casale and a lawyer for Sollitto argued to the state Supreme Court that to allow such a remedy would clog the courts and drastically alter the law of trusts and estates. The case, In the Matter of the Estate of Madeline Stockdale , A-121-06, stems from a challenge to a 2000 will drafted by Casale that named Sollitto, his friend and longtime client, as the chief beneficiary of Madeline Stockdale's estate and Casale the sole executor. The challenger was the Spring Lake First Aid Squad, which under an earlier will would have received most of the estate. Casale drafted the later will for Stockdale, a nonagenarian, while she was in a rehabilitation facility recovering from a hip fracture. It was executed on Jan. 3, 2000, a day before she had throat surgery. The same day, Stockdale also signed a real estate contract -- drawn up by Spring Lake, N.J., solo Thomas Foley on instructions from Sollitto -- by which she agreed to sell Sollitto her Spring Lake home for $1.3 million. The contract required only a $1,000 initial deposit, followed by a second deposit of $56,000, with Stockdale taking back a purchase money mortgage for the rest. 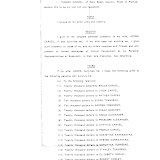 The will drafted by Casale excused Sollitto's obligation to pay off the mortgage, since as residuary beneficiary the money would go to him anyway. Stockdale also gave Sollitto power of attorney over her affairs. Stockdale died three months later. Superior Court Judge Ronald Reisner of Monmouth County, N.J., refused to admit the 2000 will to probate, saying it appeared to be the product of "sharp dealing" by Casale and Sollitto. He also refused to enforce the sale of the house. Reisner denied the squad's claim for punitive damages but awarded it $1,193,726 in counsel fees against Sollitto and Casale, relying on In the Matter of the Niles Trust, 176 N.J. 282 (2003). That case held that an estate executor or trustee who benefits from undue influence to the detriment of the estate may be required to pay counsel fees. 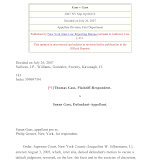 The Appellate Division reversed, holding Niles did not apply because Sollitto was not an executor or fiduciary, neither he nor Casale had depleted the estate and there was no attorney-client relationship between the squad and Casale. However, the court remanded for reconsideration of punitive damages, finding Reisner apparently had mistakenly thought the fee award was the equivalent of a punitive award. Casale and Sollitto appealed. On Oct. 9, Sollitto's lawyer, Frederick Dennehy, urged the state supreme court to reject the squad's claim for punitive damages and counsel fees. "The question of fee shifting hovers like a ghost over all settlement negotiations" in disputes over wills and estates, said Dennehy, of Woodbridge, N.J.'s Wilentz, Goldman & Spitzer. 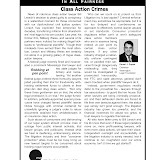 "Punitive damages are a much larger issue," he added. "We have the possibility that in ... virtually every will contest, there will be an application and a claim to entitlement for punitive damages." The result, said Dennehy, would be to clog the courts with estates that cannot be settled because of the possibility of fee shifting and punitive damages. "Why are you so fearful?" asked Justice Roberto Rivera-Soto. "This would be a seismic change in the law of estates and trusts," Dennehy replied. Rivera-Soto wasn't convinced, asking Dennehy why rules concerning fee shifting and punitive damages should not apply in will contests the way they do in tort claims. Dennehy said those rules could apply if there were clear indications of fraud, but not of undue influence. "Undue influence covers a very wide spectrum," Dennehy said. Casale, arguing pro se, said Niles did not apply here because there was no diminution of the estate as in Niles. "In Niles, the Court had to send a message out," said Casale, a former head of the New Jersey State Bar Association's Real Property and Probate section. Rivera-Soto asked about the circumstances under which punitive damages might be awarded. Casale said they could be available if there were compensatory damages, but since there were none in this case, punitive damages cannot be awarded, he said. Casale added that there is no evidence he exerted influence over Stockdale. "There was not a single finding that I exercised any undue influence," he said. "I couldn't have. I didn't know the woman long enough." On May 11, a Monmouth County jury hung on conspiracy and theft-by-deception charges against Casale and Sollitto for allegedly bilking Stockdale out of her fortune. Casale told the justices they would send a bad signal to the bar by ruling in favor of the rescue squad. "I know a lot of practitioners who will stop doing wills and estates," he said. "It will just be too risky." The rescue squad's lawyer, Spring Lake solo William Gearty, said the two did exert undue influence over an elderly woman in ill health. "They were the 'driving force,'" said Gearty, quoting Reisner, even though Sollitto was not a fiduciary. By persuading Stockdale to change her will, they engaged in a "pernicious tort." Several justices suggested it may not be possible to rule in the rescue squad's favor because there is no indication it suffered financially. Gearty disagreed. "It's difficult for the squad to accept the fact that it was not harmed at all," he said. Stockdale's property is now worth about $5 million and, under the terms of her original will, the rescue squad was to be given the property after she died. "They still don't have title to the property seven years after Mrs. Stockdale died," Gearty said. Justice Virginia Long asked Gearty to respond to Dennehy's assertion that a ruling in the rescue squad's favor would jam up the Chancery Division with contested claims. The court's ruling in Niles has not led to that result, said Gearty, and there is no reason to believe it would happen if the court ruled in the rescue squad's favor. "I don't see the floodgates opening in any fashion," he said. "This case is identical to Niles." Sources reveal that there is indeed an on-going investigation involving Brooke Astor’s estate. But one of the targets of the high-priority probe is NOT Ms. Astor’s son, Anthony Marshall, but the Westchester County Surrogate’s Court Judge himself, Anthony A. Scarpino, Jr. It was also revealed that a parallel federal probe by the FBI Public Corruption Unit involves the Judge and Jeanine Pirro, the former Westchester County District Attorney. A forty million dollar payday is no good reason to lie to current Appellate Division, First Department, Presiding Justice Jonathan Lippman. Nor was $40 million big ones a good reason to have lied to Presiding Justice Lippman when he was New York State’s Chief Administrative Judge. But that’s exactly what happened….MORE…. There are numerous reasons why lying to Judge Lippman is so objectionable: you simply shouldn’t lie to people, and it’s not a nice thing to do. It’s especially egregious when a lawyer, and who is also a judge, intentionally misleads his own boss- the top administrative judge for the entire state of New York. And, of course, there are many other reasons. “Lippman’s a stand-up guy, just a really decent man,” said one twenty-year-plus veteran of a downstate Appellate Division, and who asked that her name not be used. “With all the crap around here, and given the large amount of laziness, it’s nice to have someone as dedicated and hard-working as Jonathan Lippman is at the First Department,” she says. 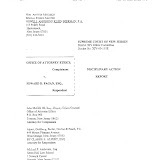 As we reported in July of 2007, New York State Supreme Court Justice Charles E. Ramos received a "waiver" of the Rules Governing Judicial Conduct from then-Chief Administrative Judge Lippman based upon information he (Ramos) provided in writing. The “waiver” pre-approved Judge Ramos to be co-executor of two estates of a couple who were alive and, importantly, over their various trusts. 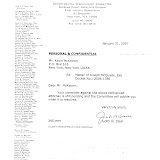 The highly unusual "waiver" of the State Judicial Rules was given by then Chief Administrative Judge Jonathan Lippman on May 7, 2003, about a year prior to the jurist's involvement in the 2004 "corporate greed" lawsuit filed by the New York State Attorney General involving the New York Stock Exchange, former Exchange Chairman Richard Grasso and then-NYSE director Kenneth G. Langone, a co-founder of Home Depot. However, on May 7, 2003, Ruth and Herb were very much alive. And though Herbert Weissberg would die about 2 months later, on July 3, 2003, confirmation keeps coming in that Herb had had a stroke and couldn’t speak due to dementia and aphasia, for well over one year prior to his death. After graduating Fordham law school, Judge Ramos joined the law office of Benedict Ginsberg in the late 1960’s. After reportedly running that law firm in the early 1980’s, Judge Ramos was appointed to the New York Civil Court by a mayoral committee. As a Civil Court judge and, from 1988 through 1993, an acting Supreme Court justice, Ramos joined several other judges in publicly criticizing the screening panels that chose Democratic candidates for Manhattan judgeships, claiming they trumped law with politics. In 1992, and after having just lost a run for the Supreme Court, he criticized the selection process in a letter to the New York Law Journal, accusing "those who have accumulated and hold on to political power" of ignoring Hispanic candidates for the bench. It is reported that the interview with the committee to approve his being a judge was an act of “going through the motions,” as the decision had already been made by the party bosses. Various interviews with sources in New York and New Jersey, and who asked not to be identified, have now confirmed that Herb could barely say “yes” or “no” and was in a fetal position during the last year of his life. 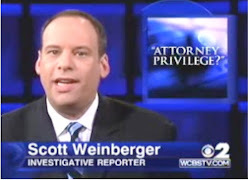 All of the nearly two dozen people interviewed for this article, and who knew the Weissberg family for decades, were surprised, if not shocked, to hear that Judge Ramos had presented himself as a long time "dear friend" of Herbert Weissberg. 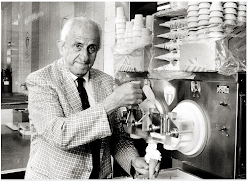 “It’s a lie,” said one 80-year-old friend of Herb’s who says he has known the Weissberg family for 50 years. It also appears that other plans to wrestle control of Herb's millions were in the works. It is also alleged that in October of 2001, Herbert Weissberg’s attorney, Paul Herman, went to the hospital to visit Herb, who was at that time extremely ill and unable to speak due to dementia and aphasia. While it cannot be determined exactly how many documents, purportedly signed by Herbert Weissberg, emerged from that hospital visit, or exactly from whom, what is certain is that Herb’s signature varies significantly from one writing to another on papers with the exact same date. 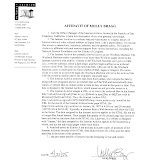 Also, and falling under the caption of "sloppy frauds," is one document supposedly prepared by Herb and which misspells the word “Gramercy” – as in the Gramercy Park Hotel- the place Herbert Weissberg had run for decades. Do People with Dementia & Aphasia Initiate Complex Estate Changes? It appears that out of thin air, but with a judicial waiver in hand, Judge Ramos then appeared and became a paid trustee. 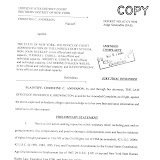 The question remains that if Judge Ramos was such “a close, personal friend of the family” and as presented to Judge Lippman, then Judge Ramos surely would have known that Herb Weissberg had been very ill, could barely scribble a signature, and could not communicate or understand anything complex- all long before the codicil giving him (Ramos) so much was even drafted. --To see the relevant papers, on the right, click on "Ramos-Lippman-Weissberg Documents"
--Note: we subsequently corrected our $20 Million figure to the now confirmed $40 Million amount. 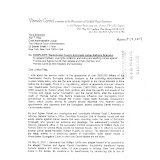 We have been asked to present the following contact information for anyone who believes that any complaint and/or information they filed with any FBI agent, squad or regional office needs re-review, reconsideration or special attention: U.S. Department of Justice, Office of Professional Responsibility, Room 3266, 950 Pennsylvania, N.W., Washington, D.C. 20530. The lawyer busted for forging a judge's order made only one mistake. His office should have been in The Bronx or Manhattan.....MORE....…. Had attorney Laurence Jurman only had a law office under the closed eyes of Thomas J. Cahill of the First Department's Disciplinary Committee, one simple phone call would have made his little fraud go away. Yes, even a little problem like faking a judge' s order can be swiftly buried by the C & C crew at 61 Broadway (Cahill and Cohen). What started as a dispute between neighbors over a swimming pool has led to the arrest of a Long Island attorney. Laurence S. Jurman of Dix Hills allegedly forged the name of Supreme Court Justice William Rebolini to a judicial order in a civil lawsuit filed as the result of the dispute, according to a statement issued by the Suffolk County District Attorney's Office in May of this year. On Wednesday, Mr. Jurman, 40, appearing without counsel, pleaded not guilty to a single count of criminal possession of a forged document in the second degree, a class D felony punishable by 2 1/3 to 7 years in prison. Mr. Jurman was released on his own recognizance by District Judge Paul Hensley and is due back to court on Nov. 19. 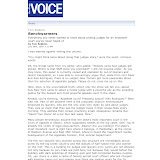 Mr. Jurman, who was admitted to the state bar in 1991, allegedly advised his clients, plaintiffs who were dissatisfied with the pace of their lawsuit, that Justice Rebolini on May 4 had denied a motion to vacate a nonexistent default by defendants. 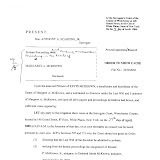 He subsequently supplied plaintiffs with a copy of the order purportedly signed by Justice Rebolini. Mr. Jurman could not be reached for comment Friday night. The background of Mr. Jurman's arrest is spelled out in a decision handed down last month by Supreme Court Justice Edward D. Burke allowing the plaintiffs more time to effect service of a summons and complaint that had laid dormant since being filed four years ago. In Yahney v. Wolforst, 16106/03, Justice Burke refused to penalize plaintiffs Jeff and Deborah Yahney for relying on Mr. Jurman. 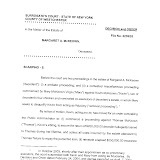 "While the court acknowledges the absence of diligence and the extended length of the delay of four (4) years in effecting service upon the defendants, both of these factors are attributable solely to egregious conduct on the part of the plaintiffs' former counsel, which this court will not impute to the plaintiffs," the judge wrote. He said he was forwarding a copy of his order and supporting papers to the district attorney and the grievance committee of the Tenth Judicial District. According to the decision, the Yahneys accused Joe and Orsola Wolforst of negligently building a retaining wall and berm, resulting in water damage to the Yahneys' property due to the changed grade of their land. 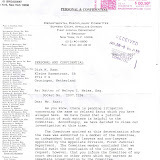 Around June 2003, the Yahneys retained Mr. Jurman to sue the Wolforsts for monetary damages and a permanent injunction. 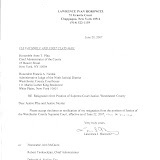 On June 10, 2003, a summons and complaint was filed in Suffolk County Supreme Court and an index number assigned. And that is where the legal process ended, Justice Burke said. "Plaintiffs expected that the defendants would be served with the summons and complaint and that the action would proceed in the normal course," he said. 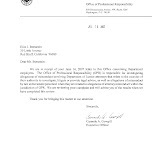 "However, this action remained dormant and without any judicial intervention as the same was not initialized by the filing of a Request for Judicial Information until the interposition of this ex parte application for relief pursuant to CPLR 306-b on September 20, 2007." Assurances Given The judge said that Mr. Jurman repeatedly assured the Yahneys that their lawsuit was proceeding normally. 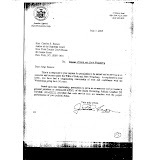 After Mr. Jurman filed the summons and complaint, he provided plaintiffs with a copy of an answer dated Aug. 15, 2003, allegedly prepared by the law firm of Tartamella Tartamella & Fresolone of Hauppauge. 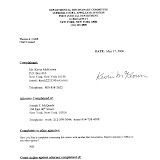 At a subsequent consultation in May 2004, the judge wrote, Mr. Jurman said he had prepared a motion to dismiss an answer served by the defendants due to their failure to appear for depositions. He later claimed his motion was conditionally granted by the court in July 2005 and finally granted, unconditionally, on Dec. 1, 2005. After that, Mr. Jurman advised the Yahneys that the Wolforsts had retained Ciotti & Damm of Mineola, and that they had moved to vacate the defendants' previously adjudicated default. 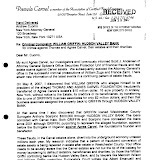 Around June of this year, Mr. Jurman allegedly told the Yahneys that Justice Rebolini had denied the Wolforsts' motion to vacate the default, and then showed them the purported order. He advised them that he was preparing for a trial on damages that remained unscheduled. The law firms mentioned by Mr. Jurman did not return calls for comment. 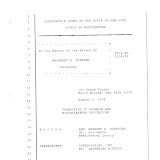 "Growing increasingly impatient of the slow progress of their case and suspicious of the representations of attorney Jurman with respect thereto, the plaintiffs contacted court personnel and the attorneys who purportedly appeared herein on behalf of the defendants," the judge wrote, "and discovered that their summons and complaint had not been served on the defendants; that the action had never been assigned to a Judicial Part; and that no motions were interposed herein nor orders issued by the court in this action." The Yahneys fired Mr. Jurman and filed a complaint with the state grievance committee in July. 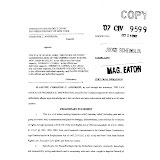 Harvey Savitt, their new attorney, then moved, under CPLR 306-b to resurrect the case by showing "good cause" for an extension of the 120-day period after filing within which service normally must be accomplished. "I had to lay bare the facts - there was good cause - the fraud of counsel leading [the Yahneys] to believe the action was continuing was egregious," said Mr. Savitt, a partner at Savitt, Krantz & Sellman in Commack, who also submitted an engineer's report showing how the property had been damaged. "They had an attorney who convinced them everything was hunky-dory." Justice Burke said the interests of justice justified an extension. 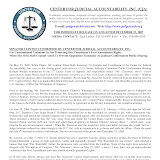 "While it has been established that a finding of good cause is generally precluded where no steps were taken to effect service and the good cause asserted by the movant is attributed to generalized claims of 'law office failure,' good cause is properly established in exceptional cases wherein the plaintiff's failure to serve process in a timely manner was the result of circumstances beyond the plaintiff's control," the judge said. According to Mr. Savitt, over the four years, his clients' land has taken a big hit. "It started out as a simple property dispute," he said. "For four years they've had a lake in their backyard." 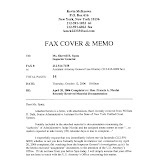 The hearing before U.S. Federal District Court Judge David N. Hurd on Thursday, October 11, 2007, again raised the issue of the urgent need for the appointment of a federal monitor over New York's broken court system…MORE…. The lawsuit against 5th Judicial District Administrative Judge James Tormey III, his former executive assistant John Voninski, Family Court Judge Bryan Hedges and Hedges' law clerk, William Dowling was filed by Ms. Bobette Morin earlier this year. The case has only made headlines upstate, but is being widely watched as the first real confrontation with out-of-control power bullies, the likes of which that haven't been seen since Tammany Hall days in the 1800's. 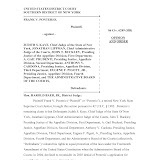 At Thursday's hearing, Judge Hurd ruled against the New York State Office of Court Administration ("OCA") attorneys' request that the entire case be dismissed. While closing certain aspects of Morin's claims, the Court ordered the continuance of the charges in which four state officials acted in their individual capacities to undermine her First Amendment free speech rights. Morin alleges that she was the target of a well-known OCA procedure- personal annihilation- which was thrust upon her when she refused to conspire with the judges, and which resulted in a storm of retaliatory acts, including assignments for vacationing clerks in far away places. And before the barrage began, Ms. Morin says, she was pointedly asked whether or not she was a "team player." Legal experts note that since the counts against OCA were dismissed, the interesting question becomes whether the four individual defendants will be represented at the taxpayers' expense or whether they are going to have to dig into their own pockets to pay for their defense counsel. One former federal prosecutor familiar with the Morin-Tormey case is not encouraged. "The court's ruling looks like a set-up to a quick burial," he says. "It's quite surprising, though, given the fact that the defendants could only have acted in their official capacity when they retaliated against the plaintiff by transferring her to far away offices, and by moving her to a window-less basement office with water leaking from an adjacent toilet." He believes an appeal to the 2nd Circuit, Court of Appeals in Manhattan would be appropriate- and successful. 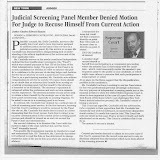 A veteran court observer believes that OCA has already begun distancing itself from the biggest troublemakers within the court system, saying, "Ethics' Chief Counsel Cahill was pointed to the door recently and will be formally replaced any day; and it looks like Tormey and his cronies are being sent up the creek without a paddle- with no OCA protection." He quickly added, "No one at OCA wants a Federal Monitor put in place, and that's a real concern." One insider, and who asked that her name be withheld, asked, "What about indemnification if Ms. Morin is ultimately successful? Do defendants Tormey, Voninski, Hedges and Dowling then sue OCA? That'll be interesting, she laughs." But while the plaintiff's attorneys continue with discovery against the defendants in their individual capacity, the retaliatory cloud of OCA-perfected-threats loom to any participants who would likely prefer not to be OCA's next target. The OCA handbook is clear: "You're next, if you say or do anything against the powers-that-be." Federal Judge Hurd might bury another OCA atrocity, but he just may be the man to start the process of fixing the broken and abused state court system. While Justice Hurd has been at the federal courthouse for over 15 years, his vast knowledge of the New York court system's dysfunctionality goes back over 40 years. "Judge Hurd is not happy about the falling level of integrity, and the nearly absent faith and trust, in New York's court system," says a former court clerk. "He knows how vicious some people at OCA can be, but he just might do something." The majority of OCA complaints concerning corruption are found in just a handful of New York's 12 Judicial Districts. And the brazen continuance and acceptance of the improper activity begs for the appointment of federal monitor. Especially in light of the flat refusal by involved administrative judges to embrace the opportunity to clean up the corruption their own inaction or lack of oversight has fueled. No one can recall any administrative judge ever publicly announcing ANY comprehensive plan to address any corruption under his or her authority. Is it any wonder why OCA's condition is now beyond critical- it is dead, impotent- a reckless, integrity-bankrupt $2.5 billion dollar disgrace. 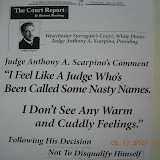 As reported on this forum on Monday, June 11, 2007, the latest look at a New York State Judicial District administrative office, provided by the Morin filing, followed The Westchester Guardian report just a few weeks earlier that a criminal investigation was called for involving the alleged improper actions of Westchester County Surrogate Judge Anthony A. Scarpino and New York City Administrative Judge Jacqueline W. Silbermann. On the same day of the Morin-Tormey federal hearing in Utica, The New York Law Journal published "NY Judge Files Three Lawsuits Over Rivals' Endorsements By Minor Parties." The 9th Judicial District has also been on the "retaliatory" radar screen since a shake up last year involving allegations of rampant judicial steering and case interference by Administrative Judge Francis A. Nicolai. 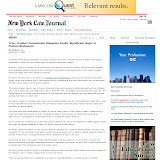 ** On October 11, 2007, this forum reported on the 9th Judicial District story, CLICK HERE FOR "Administrative Judge Nicolai Upset Election Can't Be Fixed." CLICK HERE FOR "Nostalgically, One Last Rigged Supreme Court Judge Election." 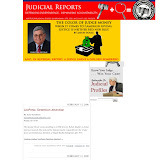 A month earlier, on Tuesday, September 11, 2007, this forum posted "3 Judges Covered Crony's 9/11 Donation Fraud." 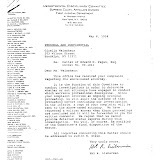 That story named 9th Judicial District Administrative Judge Francis Nicolai in furthering a cover up of over $100,000.00 stolen from American Red Cross 9/11 donations, and which subsequently resulted in a fraud against an insurance company that partially paid out on a submitted theft claim. It is alleged that an attorney from a White Plains, New York, law firm, McCarthy Fingar, filed fraudulent papers in that matter, and while various judges either looked the other way, remained silent or ordered questionable and obstructive directives to protect a political friend. CLICK HERE TO SEE "3 Judges Covered Crony's 9/11 Donation Fraud." "Garson" - accurately describes the corruptive court chaos in the 2nd Judicial District. New York Citizens to Feds: "Washington, We have a Problem"
We echo the view of the many viewers who have shouted, "Bring in the Feds." The New York State court system is broken-- paralyzed by abuse and corruption. The New York State court system needs a federal monitor. Ms. Morin, her attorneys and the Hon. David N. Hurd, sua sponte, could- and should, ask for one now. ** "One of the Few to Confront Corruption Flees Albany"
…Remember the words of David Grandeau, "Ethics Matters." …we were subsequently corrected: not $20 Million, but $40 Million…. While most people knew the corruption was bad, by personal experience or word of mouth, no one ever read much because the information never made it to print. 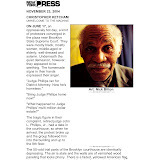 In one case, powerful local thugs were even able to kill a New York Times court corruption investigation in White Plains conducted by 3 full-time NY Times investigative journalists over an 11 month period. The story was "put to bed"-- done, completed-- ready to be published. But it wasn't. The story was killed- by a phone call. Yes, the toxic bubble of corruption is about to explode within the court's 9th Judicial District, which includes Westchester, Rockland, Putnam, Dutchess and Orange Counties. Start buying The Journal News. Real news is coming soon, and we believe they will be printing it. The federal indictments are coming, and the clean-up is near. Together, we can all help bring integrity back to our treasured court system, and see a long-overdue restoration of law and order. It's good to have you back, Journal News. We missed you. Judge Francis Nicolai is suing three political parties that would not support him for state Supreme Court justice, saying they did not follow the rules when choosing whom to endorse in November. Nicolai, the administrative judge for the 9th Judicial District, filed legal papers last week against the Conservative, Independence and Working Families parties, and their candidates for the bench. Nicolai claims that the parties violated state election law by mishandling their conventions. The lawsuits demand that all three parties prove they acted properly. "They must follow the procedures," said Thomas Abinanti, Nicolai's lawyer for the lawsuits against the Working Families and Conservative parties. "If they didn't, then their nominations are null and void." Party leaders called Nicolai's lawsuit a case of sour grapes. "Do you really think he would be suing the parties if he had gotten a nomination?" Independence Party spokesman Richard Rhodes said. Nicolai and five other judges are vying for three seats on the state Supreme Court in the 9th Judicial District, covering Westchester, Rockland, Putnam, Orange and Dutchess counties. Stripping minor-party endorsements from the other candidates could make a difference in a close race for the 14-year job, which pays $136,700 annually. The suits put Nicolai in the unusual position of suing his two Democratic running mates - Rockland County Surrogate Judge Robert Berliner, who was endorsed by the Working Families Party, and Orange County Surrogate Judge Elaine Slobod, endorsed by the Conservative and Independence parties. "The only reason he's doing this is because he only has the one line," said Pat Welsh, chairman of the Working Families Party. The Republicans running in the 9th Judicial District are incumbent state Supreme Court Justice William Sherwood, Westchester County Judge Rory Bellantoni and Christine Krahulik, an Orange County Family Court support magistrate. The Independence Party endorsed Bellantoni and Sherwood. The Working Families Party endorsed Bellantoni and Krahulik. The Conservative Party endorsed all three. "Judge Nicolai has the right to commence a frivolous and wasteful lawsuit that takes up the valuable time of our already overloaded judicial system, if that's his choice," Conservative Party Chairwoman Gail Burns said. Two other state Supreme Court candidates are running solely on the Right to Life Party line. That party also endorsed Sherwood. Nicolai filed the lawsuits in state Supreme Court in Westchester, but the case was transferred to Albany. Jeffrey Buss, Nicolai's lawyer for the suit against the Independence Party, said there were questions about fairness and openness during the convention. "The whole process needs a spotlight on it," Buss said. While Sherwood is trying to hold onto his Supreme Court seat, two others are open. Republican Justice Howard Miller has reached the mandatory retirement age of 70, while Republican Justice Lawrence Horowitz was forced to resign this year after allegations of unprofessional conduct. Nicolai, a Westchester County Court judge, wants to return to the state bench. He served one 14-year term as state Supreme Court justice until 2004, when he did not seek re-election because Republicans did not cross-endorse him. He ran instead for County Court and won. That allowed him to remain the administrative judge of the district, a position he has held since 1998. This year may be the last for judicial conventions in the state's districts. However, the same was said last year after a federal judge ruled the system unconstitutional because it gave too much control to party leaders rather than voters and denied candidates a fair shot at getting on the ballot. The conventions were allowed because an appellate ruling upholding the decision came too late to put a new system in place. The U.S. Supreme Court decided to take the case and heard arguments on it last week. 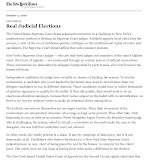 Is the present process for nominating candidates for state Supreme Court justice in New York constitutional? Those who read the questions posed this month by justices of the Supreme Court of the United States might infer that the high court will come down on the side of the much-criticized, 86-year-old nominating system, which caters to political insiders and excludes those who are not. Scrutiny of the state's nominating process came in oral argument in the case of Lopez Torres vs. the State of New York Board of Elections. Under review is a judicial convention system that two lower federal courts found unconstitutional, on the ground the process was totally dominated by political party leaders and not by independent delegates. The lower federal courts ordered the system dismantled and replaced by a traditional primary - meaning voters decide who gets their party's nomination - but in September 2006 and again last month judges were nominated under the same flawed system. Justice David Souter remarked during the high court's hearing that he was not sure whether a system "in which the party bosses select the nominee is for constitutional purposes significantly different from the federal system for picking district judges." Justice Stephen Breyer suggested that maybe the present system was preferable to "a system where people raise $4 million from the lawyers in order to run for office." Perhaps when the high court issues its ruling, New Yorkers will discover that the justices were merely playing devil's advocate as they fished for answers. In any event, no matter how the case is decided, the state Legislature appears unready to swiftly provide a remedy - despite having had some 21 months to prepare one. The state Senate Judiciary Committee held a public hearing on the matter in January, but no legislation was approved. So the imperative remains. The Legislature must enact reforms to ensure that independent-minded delegates are elected. Only then can control be wrestled from the county party chairmen who now dominate the convention. Switching to a primary system would be no improvement until there is another change - a move to public financing of political campaigns. Such was a longshot in the early part of the year, when Gov. Eliot Spitzer discussed his Albany "wish list"; it would be an impossibility today, with trust between the Democratic governor and Joseph Bruno, Republican leader of the Senate, at a new low. 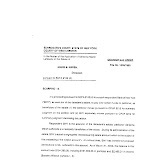 In January 2006, federal Judge John Gleeson, ruling in Brooklyn, found that the state system was so exclusionary that it violated the voters' right to freedom of political association under the First Amendment to the Constitution. Gleeson found that Margarita Lopez Torres, a Brooklyn Surrogate Court judge, had been blocked from the opportunity to run for state Supreme Court, by political leaders angry because she refused to make patronage appointments. Gleeson said the system deprived voters of a say in who was on the final ballot and instructed the state to find another procedure. Until that happened, he ordered that candidates for state Supreme Court be chosen by primary elections. He later delayed implementation of a primary election after learning that such an election, without public money to finance judicial campaigns, might amount to a "cure" being worse than the "disease." Unlike county and family judges who are selected by voters in a primary held in one county, state Supreme Court candidates would be required to run for the nomination in districts with several counties and spend substantial amounts of money and time to reach far-flung voters. Our 9th Judicial District covers Dutchess, Orange, Putnam, Rockland and Westchester counties with close to 1.5 million potential voters. In such a situation, favored would be wealthy candidates or those who would accept contributions mainly from lawyers or litigants. Present laws designed to make conventions democratic are anything but democratic. In the 9th District, for instance, Republicans now choose 139 delegates and Democrats 76 every September in the regular primaries. Many are party functionaries who depend on the party to gather at least 500 names on nominating petitions for them. For the most part, they rubber-stamp recommendations of party leaders from the five counties. New York Chief Justice Judith Kaye recognized the faults of the judicial system several years ago when she appointed a 29-member Commission to Promote Public Confidence in Judicial Elections. 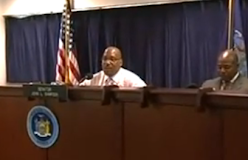 Westchester's John Feerick, professor of law and former dean of law at Fordham, chaired the commission. The report castigated the convention system and said that the only good alternative was to make it more transparent, deliberative and open to all qualified people, including those who lack political party connections. Delegates should be elected in the year preceding the convention and serve three years instead of only the current two or three weeks. The number of delegates should be reduced and so should the number of names they are required to get on their petitions. We agree. Judge Kaye took her own first step toward reform Feb. 8, when she created Independent Judicial Election Qualifications Commissions for each of the judicial districts; 15 people - lawyers and lay people - were selected to each commission by Kaye, the presiding judges of the four appellate divisions and the state and local bar associations. 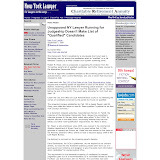 The commissions interviewed candidates for judge and, prior to the conventions, announced the names of those found qualified. In fact, a number of people found qualified were nominated at the conventions for Supreme Court, and during the primaries for other judicial positions. Kaye said such commissions "do not alter the current elective system but rather bolster it by providing credible, independent local bodies to evaluate the qualifications of judicial aspirants." That was one step toward reform. The state Legislature must complete the job by adopting improvements for the convention system so that next September party chairs no longer will be in control of nominations. And it should get started before the Supreme Court renders its decision. Join the conversation about editorials, Community Views and letters; Visit the "Opinon" forum at LoHud.com/forums. We believe that America's legal system, as it currently operates, both invites and rewards lawsuit abuse. Our legal system has become a lawsuit factory, churning out millions upon millions of unnecessary lawsuits year after year. This ongoing abuse by seedy lawyers and their equally seedy clientele nationwide undermines the integrity of America's legal system while clogging the courts with frivolous lawsuits. These lawsuits, which are in many instances nothing short of legalized extortion, choke America's court dockets and force meritorious cases to be shoved to the back burner. Why should someone who has a legitimate claim be forced to wait in line for his or her day in court behind hundreds if not thousands of ridiculous lawsuits? Easy answer - he or she shouldn’t. Abuses of the legal system that allow this kind of injustice to occur are not only wrong, they are immoral - and we want to do something about it. We fervently believe that honor, integrity and respectability desperately need to be restored to America’s judicial system - and restored immediately. Whenever people abuse the system, whether it be lawyers or their clients, we all pay and we all lose. We believe lawsuit abuse is a serious topic that affects every man, woman and child living in America and as such, we treat the subject matter quite seriously. However, we have chosen to get our message out in an entertaining, thought provoking manner. We have found that our web visitors are more likely to read and act upon the information when it is offered up with an interesting twist. 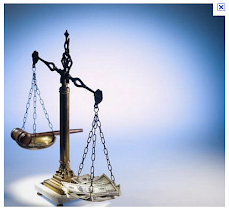 We believe that lawyers and their clientele that bring forth frivolous litigation should be made to pay - and pay big. That's precisely why we have proposed the doctrine of loser lawyer pays. Not loser pays, but LOSER LAWYER PAYS. Simply put, that means the lawyer that filed the stupid lawsuit should have to pay the court costs and legal expenses of the other party when that stupid lawsuit gets thrown out of court . Doesn't this just make sense (except, of course, to the lawyers)? After all, every lawyer ultimately determines every single case he or she chooses to work on and which lawsuits he or she chooses to file. If it's a lousy case, then they don't have to take it. If they do and the court deems the lawsuit frivolous in nature, then make that lawyer pay the legal costs of the person or company they sued. We need to STOP making the lawyer's client cough up the dough for stinking up the court with his or her stupid lawsuit and START making the loser lawyer who took the case and filed the lawsuit pay the freight. Now the Republicans are down 100,000 to the Dems in Westchester County alone... therefore the minor parties become more important..in fact, both parties fight over who gets the Independent, Conservative and Working Families lines...but the big prize is the first two (the Independent and Conservative)because if a Democrat has either he or she is guaranteed the election because of registration. If a Republican is to have any chance he needs to have three lines: Republican, Independent and Conservative. The man controlling the Independent Party is Julio Cavalo... Therefore, he is in the catbird seat, vis-a-vis judges. And what does he (Julio Cavalo)want for his nomination...ask those who have received it...and ask those who haven't... in fact if a grand jury was convened the issue of extortion might very well be the subject of the grand jury's investigation. In the good old days, cross-party endorcements and fat-cat bullying determined who would be a judge in the 9th judicial district. Then, judicial steering would seal the fate of "justice" so that the party thugs' predetermination of a case would go as planned. It's a system- a CORRUPT one, of course, but that's the way things have been going in the 9th judicial district for a very long time. Ninth Judicial District Administrative Judge Francis A. Nicolai filed three lawsuits Friday to nullify the minor party nominations of four rivals for Supreme Court. Judge Nicolai - who named Conservative, Working Families and Independence Party officials and other candidates, including his two Democratic running mates - is running for one of three open seats in the five-county district. He claims the parties followed improper procedures that violated election law in deciding which candidates to back. The endorsements are important because they carry extra ballot lines and votes. In tight contests, those votes can be the margin of victory. Judge Nicolai's move, sources said, prompted a request from one of his Republican adversaries that the case be moved out of the district and that Judge Nicolai be temporarily replaced as administrative judge while the litigation is pending. Yesterday, Deputy Chief Administrative Judge Jan H. Plumadore ordered the case transferred to Albany at the request of "all the candidate litigants" in the three cases. Judge Nicolai continues to serve as the district's administrative judge, said David Bookstaver, spokesman for the Office of Court Administration, because there is "absolutely no reason he can't be fair and impartial in terms of his duties as administrative judge pending the outcome of a case that will be resolved quickly in a different venue." Thomas Abinanti, who is representing Judge Nicolai in two of the lawsuits, said that Judge Nicolai had notified OCA in advance that the lawsuit would be filed in Westchester County and asked for the cases to be moved to another county. One of Judge Nicolai's Republican rivals, however, said he had been in touch on Tuesday with Judge Plumadore, who at the time appeared unaware that Judge Nicolai had filed lawsuits in Westchester County. The litigation pits Judge Nicolai against two fellow Democrats running for the three seats in the Ninth: Orange County Surrogate Elaine Slobod, who has been nominated by the Independence, Conservative and Working Families parties, and Rockland County Surrogate Robert M. Berliner, who is also a Working Families nominee. The two Republican Party candidates, whose third party nominations Judge Nicolai is seeking to upend, are incumbent Justice William E. Sherwood, who is running for a second term on the Conservative and Independence lines, and Westchester County Court Judge Rory J. Bellantoni, who is running on the Conservative, Independence and Working Families lines. Judge Nicolai, who was elected as a Supreme Court justice in 1990, decided not to seek a second term in 2004 in the Ninth District, which is usually favorable terrain for Republicans, after he was unable to secure the Independence nomination. Instead, he ran for - and won - a seat on the County Court in Westchester, which has become increasingly Democratic in recent years. After his election, Judge Nicolai, who has been administrative judge since 1999, was named an acting Supreme Court justice. Sources identified Justice Sherwood as the candidate who had asked for Judge Nicolai to be replaced during the litigation. Justice Sherwood did not directly acknowledge that in an interview yesterday but did not deny the reports. He also said he had sent e-mails to all candidates involved in the litigation in which he raised the issue of "what an awkward situation" it could create. 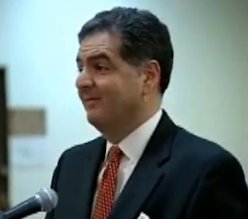 Judge Bellantoni said in an interview that, when he had called Judge Plumadore on Tuesday to give him a "heads up" about Judge Nicolai's lawsuits, Judge Plumadore had left him with "the impression that he was unaware of any pending litigation." Judge Bellantoni added that he believed the cases should be moved because there were concerns about any litigation being handled within the district where Judge Nicolai was the supervisor of the four defendant judges as well as any judge to whom the case would be assigned. Judge Bellantoni also said that since the normal process is for Judge Nicolai to assign election cases, a transfer was "preferable" because it would eliminate the need to ask any questions about how the cases were assigned. Mr. Abinanti, Judge Nicolai's lawyer, said that the lawsuits had been filed in Westchester as a "convenience" because most of the parties were located there and he was facing a tight statute of limitations deadline. "We knew it was going to be transferred," he said, because "it couldn't be tried [in Westchester] because every judge would have to be recused." Meanwhile, Mr. Abinanti said it was "somewhat strange" for Justice Sherwood to complain about Justice Nicolai filing a lawsuit in the Ninth District while bringing his own lawsuit in Dutchess County, one of the other counties within the district. In that lawsuit, Mr. Abinanti said, Justice Sherwood is seeking to remove the Right to Life Party symbol from a combined line with the Conservative Party. The lines were combined because of a state law limiting the number of lines per candidate to three, he said. Justice Sherwood said that, unlike Judge Nicolai, he had not sued any other judges but had only named the state Board of Elections as a defendant in an effort to force a re-arrangement of the way the ballot is structured. Mr. Abinanti represents Judge Nicolai in the lawsuits filed against the Conservative (Nicolai v. Kelleher, 20495/07) and Working Families (Nicolai v. Kelleher, 20496/07) parties. Judge Nicolai claims the Conservative nominations should be voided because its nominating convention was held on an unauthorized date, conducted an improper secret ballot and excluded both the public and alternate delegates. His claims against the Working Families nominations were that a vote was taken without a quorum and that its delegates were not properly apportioned among assembly districts contained within the ninth judicial district. Similar claims were raised in Judge Nicolai's lawsuit against the Independence Party nominations. 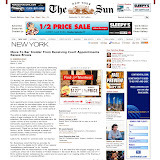 In that lawsuit, he is being represented by Jeffrey D. Buss of Smith Buss & Jacobs in Yonkers.